I found that after writing the first “Archer Vocabulary” post, I not only quickly internalized the definition of “bailiwick,” I found myself trying to use it in sentences. So whether anyone else is reading this or not, it’s a potentially fantastic way for me to expand my word choice. After a botched job in San Marino, Mallory Archer finds herself on a video call with Len Trexler, head of ODIN, ISIS’s chief competitor in the world of espionage and security contracting. What starts as a verbal assault softens into a schoolgirl’s yearning as Mallory begins to list Len’s physical features. MALLORY: Just who in the hell do you think you are? Getting ISIS blacklisted at the UN? LEN: I had nothing to do with that. MALLORY: Embarassing me in Berlin? LEN: The whole hotel was embarassed. MALLORY: Stealing all of my prospective clients? MALLORY: And no matter which way I turn, you’re butting in that big, fat, strong, aquiline nose of yours. LEN: You said it was the nose of a Caesar. The dialogue continues to a series of double entendres leaving Sterling nauseated and yelling “Phrasing!” ad nauseum. The word begins with the stressed short a as in “apple,” not the “aw” sound from “awkward.” There are two acceptable pronunciations of the final syllable, but this episode utilized the first option with the long i sound. The word “aquiline” appears on the very long list of words Barron’s recommends in its GRE preparation materials. Merriam-Webster defines the term as “resembling an eagle” and more specifically as “curving like an eagle’s beak.” Mallory Archer uses the word in an endearing way to describe a nose, whereas I found examples online giving it a negative connotation when used to describe human facial features. Anyone else who enjoys Romance languages may notice a similarity to the Spanish word “aguila” which means “eagle.” These words share the Latin root word “aquila” meaning the same. 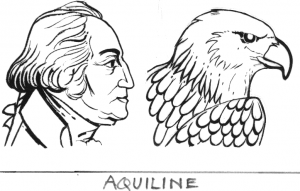 VocabMadeEasy.com chose George Washington as an example of aquiline features in their picture flashcard. Though the illustration doesn’t necessarily show a curved nose, it does model the sharp and focused features of one of nature’s most graceful killing machines. 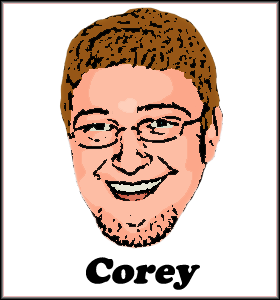 I’m talking, of course, about George Washington.